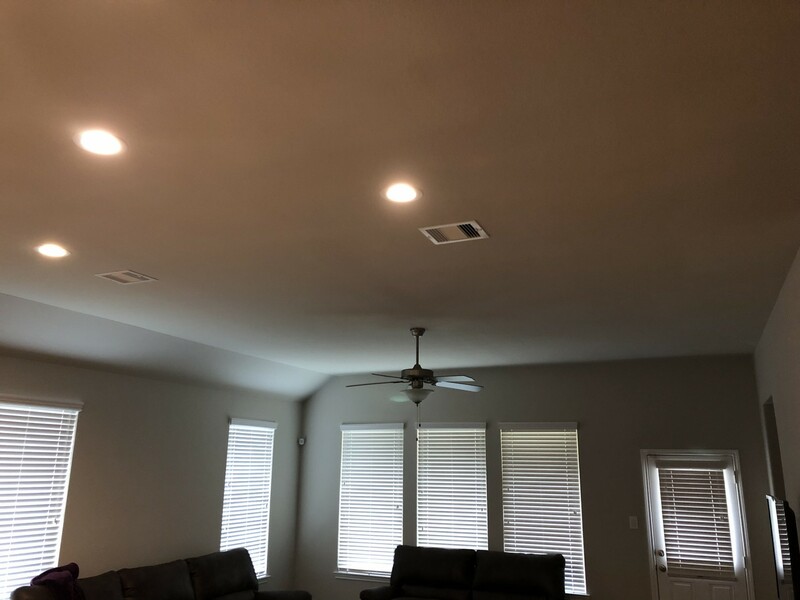 Replacement LED Downlights for 6" Fixtures - 65 Watt Equivalent LED Can Light Replacement - Integral Junction Box - 650 Lumens: Showing Natural White (Left), And Warm White (Right). Replacement LED Downlights for 6" Fixtures - 65 Watt Equivalent LED Can Light Replacement - Integral Junction Box - 650 Lumens: Shown Installed In Drywall Ceiling, Prior To Wiring Connections. Does Not Require Joist Support. Replacement LED Downlights for 6" Fixtures - 65 Watt Equivalent LED Can Light Replacement - Integral Junction Box - 650 Lumens: Shown Installed In Hotel Ballroom Entryway Ceiling. Replacement LED Downlights for 6" Fixtures - 65 Watt Equivalent LED Can Light Replacement - Integral Junction Box - 650 Lumens: Shown Installed In Hotel Ceiling. This LED downlight comes with a built-in junction box and is designed for retail lighting, commercial lighting, residential lighting, office lighting, kitchen lighting, bathroom lighting, basement lighting, and more. The powerful, 6" LED light is IC rated for safe contact with insulation. The downlight can be used for new construction or remodel projects and installs easily without any can housings needed. Its integral junction box houses the dimmable constant-current driver and allows you to easily wire the light to code. Round and square knockouts can be used for conduit or non-metallic sheathed cable. The 6-inch LED downlight emits up to 650 lumens of natural or warm white illumination. And with a high color-rendering index (CRI) of up to 92, the LED fixture shows the true colors of fabric, objects, and surroundings. This energy-efficient LED light consumes 10 watts of power and is comparable to a 60-watt incandescent bulb. The downlight has 120 VAC operation and follows the guidelines of California Title 24 Part 6, Building Energy Efficiency Standards. I bought this product because there wasn't space above the ceiling for a traditional can light. The low profile of this fixture was perfect, and the cost was comparable to buying the housings and LED bulbs from a big box home improvement store. This was really simple to install- I had all 5 installed in about 30 minutes. The color looks consistent across all five fixtures. I purchased three of these LED lighting units to replace medium screw base fixtures. The ease of installation and the wonderful light source is top notch! These 3 units were installed in my kitchen drop ceiling, but know they would install in any type of material. many times. They ship fast and are easy to deal with. Exactly what I expected. Very good price. Easy install.